This is not the first time the Nexus 5 has showed up on video, but it’s certainly not an unintentional leak. A clip that’s over 7 minutes long is up on YouTube and it offers a hands-on demo of the upcoming Google phone in action. Posted by smartphones.sfr.fr, the video appears to be that of a prototype version of the handset. 1.26 minutes into it, you can clearly see the OS build noted as Key Lime Pie. But we do know that Google kept the KitKat nickname a secret from employees who didn’t need to know it until September. The date on the lock screen is October 9. So let’s assume we’re looking at a new video of the handset running an older version of the OS it is intended to debut with this month. If you had any doubts about the manufacturer for whatever inexplicable reason, the LG branding can be seen clearly on a sticker on the back panel. It all started when the smartphone was pictured in the hands of a Google employee (video posted below) at the Android unveiling of the KitKat statue. It was then spotted going by the model number D820 and unsuccessfully attempting to pass through the FCC without making a scene. 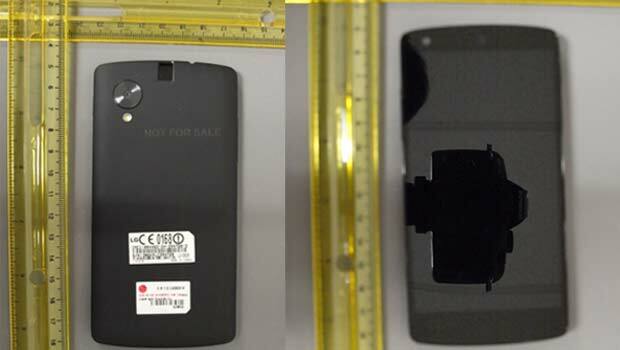 Then came photos courtesy of FCC filings and some leaked specs pointing to a 4.9” touchscreen on it. Early October treated fans to a few details about the phone – a fingerprint sensor in addition to face recognition. More features were outed on October 5th – 8MP and 1.3MP cameras, a 2.3GHz quad core Snapdragon 800 chip, a 2300mAh battery and 32GB memory. Lastly, there were rumors about Google fixing an October 15 launch date for the new Nexus. Tomorrow? Sounds unlikely.